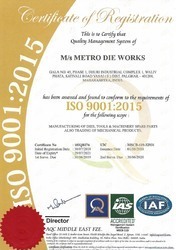 Metro die Works, Incorporated in the year 1982, is an ISO 9001:2008 certified company, based in outskirts of Mumbai, India. Since the beginning we have imprinted strong footsteps in the business for our products, with the strong commitment to our esteemed clients in terms of supirior quality and timely delivery. Our facilty is staffed with highly skilled tool makers, using the best and latest machinery, on the finest raw materials possiblle. MDW provides off-the-shelf fastener tooling and can meet any custom or specialized tooling need. With over 25 Years of experince in the fasteners industry, MDW can provide our customers assistance on tooling design, consulting on problems or perhaps ways of increasing your production and tool life. MDW's vast in-house stock of material and supplies insures that these catalogued, and many other tooling items, are produced to on-time delivery schedules with the highest quality control. Our offered products are designed with high precision and meet the set global standards and are avaliable in varied sizes, patterns, designs and shapes. Spread over a wide area of land, our infrastructure is carefully divided into different units, to ensure that all the on-going procedures are carried out in the most efficient and streamlined manner. It consists of manufacturing, warehousing, packaging, in-house quality testing and sales & marketing unit. Large production capacity, rich vendors’ base and well-designed warehousing unit, we have been able to manage and meet the precise needs of our esteemed customers in the most efficient manner. Since we are client centric organization; therefore we focus on providing quality products to the clients and that too in competitive prices so as to provide complete satisfaction to them and maintain a healthy long term relationship with them. Satisfaction of our clients only let us grows and leads the market. Furthermore, we believe in delivery all products on time so as to gain the confidence and trust of clients. "We, At Metro Die Works, Will Strive For Continuous Improvement within Our Origination In Terms Of Products and Services to Satisfy the needs of Our Customer and Will continually Improve the Effectiveness of Our Quality Management System." Our team consists of dexterous and dedicated professionals, who work in close coordination with each other, to avoid any hassle in the workplace. We work to attain maximum customer approval and satisfaction, boasting on a very trouble-free workplace. To understand and meet the precise needs of our esteemed customers, we follow customer centric approach and in close coordination. To enhance and polish their skills in the most efficient manner, we organize regular training sessions through seminars and workshops. We have been able to cater to the precise needs and requirements of our esteemed customers, owing to our infrastructure and skilled professionals. Quality assurance procedures are followed, to ensure that the premium quality of the offered industrial fasteners is never compromised at our end. Customer centric approach and ethical business polices are followed, in a zest to attain maximum customer approval and satisfaction. We also offer different modes of payment, keeping the ease of our customers in mind.